The Federal Government on Tuesday said it had authorised the Bill and Melinda Gates Foundation to start the repayment of $76m polio eradication facility to Japan. The Minister of Finance, Mrs. Kemi Adeosun, said this when she received a delegation of Japanese parliamentarians in Abuja. The delegation was in Nigeria to conduct an assessment on the level of usage of the Overseas Development Assistance extended to Nigeria since 2014. 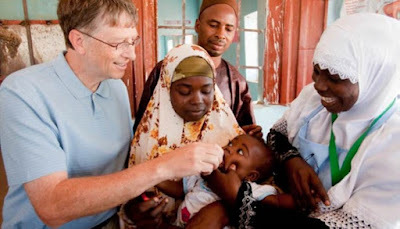 The authority for repayment was given to Bill and Melinda Gates foundation following the eradication of polio in the country as a result of the ODA facility provided by the Japanese government valued at $76m in 2014. The ODA facility was structured for repayment after four years. With this development, the Bill and Mellinda Gates Foundation will start repaying the facility to Japan this year. Adeosun expressed happiness that the structure of the transaction was favourable to Nigeria because, after four years, Nigeria can ask the foundation to trigger payment of the polio eradication facility. She informed the Japanese delegation that Nigeria is fast growing and evolving from negative to positive areas. This, according to her, was made possible through the government’s determined fight against corruption and the desire of the current administration to lift Nigerians out of poverty. She gave the Japanese delegation the assurance that the Nigerian economy will transform in the coming years, adding that there is a need to deepen relations with Japanese companies in the country. Adeosun said that since Nigeria was a middle-income country, the government would require the expertise of Japanese companies for infrastructure development. In his address, the leader of the delegation, Mr Kiyoshi Ejima, described Nigeria as a power house with rich natural resources with which Japan has tried to strengthen its relationship. He said that since the government had set a target of becoming one of the top 20 economies by the year 2020, his country would support Nigeria towards realising its 2020 target.